With the European Union in a slump, Cameron has turned to emerging BRIC nations – Brazil, Russia, India and China – as alternative markets for British exports and investments, with little to show so far. 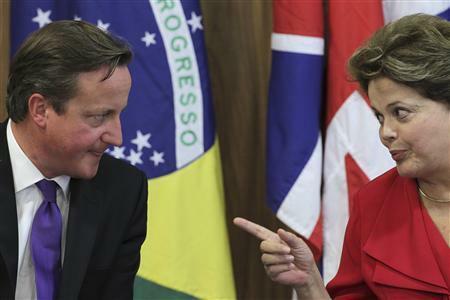 With executives from 45 leading British companies in tow, Cameron met on Friday with Brazilian President Dilma Rousseff, who invited British businesses to invest in Brazil oil and gas, defense, mining and financial services industries. “I think we can do a lot better,” Rousseff said of growing but still negligible trade and investment flows between the two countries. Rousseff said British interest in Brazil had come at the right time after her government announced last month a $66 billion investment in road and railway building as part of a massive plan to upgrade her country’s dilapidated infrastructure, which includes modernizing ports and airports. Following the success of the London Olympics this summer, Rousseff said Brazil was seeking British cooperation to prepare for the 2014 Soccer World Cup and the 2016 Olympics Games. Cameron said British companies had signed more than $161 million in deals during his two-day visit, with another $400 million in potential contracts for companies that can help Brazil get ready for the two global sporting events it will host. Earlier on Friday in Rio de Janeiro, accompanied by British companies hoping for a slice of Brazil’s enormous energy potential, Cameron met with Maria das Gracas Foster, the president of Brazil’s largest company, the state-led Petrobras. Foster laid out the oil company’s $236 billion investment plan for the next five years to develop Brazil’s sub-salt off-shore oil reserves and become one of the world’s top producers. “We have an enormous potential in the oil and gas field, an enormous challenge, and we are open for business for the British industry in oil equipment and services,” Foster told them. Cameron visited the industrial state Sao Paulo on Thursday to open a new $100 million factory by Britain’s JCB to make backhoes and excavating equipment. “If you can’t beat them, join them,” he said in a speech to businessmen, urging a greater British partnership with Brazil. Esse post foi publicado em Assuntos Internacionais, Brasil, União Européia e marcado Cameron, Dilma, parceria Brasil-Reino Unido, parceria britanicos, Reino Unido, Rousseff, UK por Joanisval. Guardar link permanente.